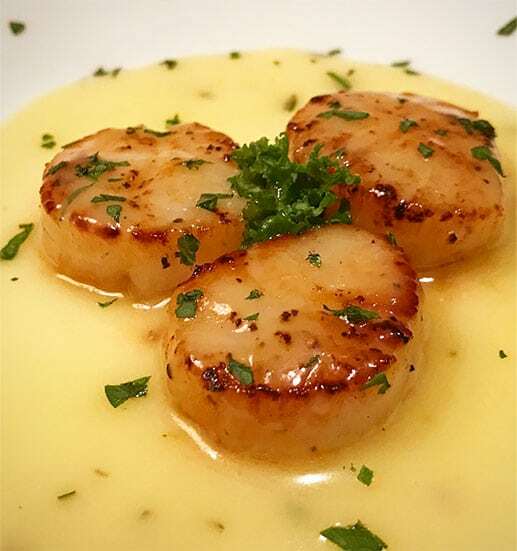 The sweet flavor of North Atlantic Sea Scallops with our luxurious and silky garlic herb seafood sauce is simply divine. We have done all the work for you to make this fantastic meal quick and easy to serve. For starters, these dry North Atlantic Sea Scallops are landed right here at the docks, on the East End of Long Island. A “dry” sea scallop is pure, meaning there is no additives or preservatives, just pure ocean scallop. To showcase this purity, we slowly poach the scallops in butter until tenderly cooked through. We then build the scallop rendered butter with white wine, clam stock, garlic and herbs to create a most heavenly sauce. The size of these scallops, along with our delicious sauce, are perfect to serve over pasta, rice, vegetables, a warm salad, or to simply enjoy a la carte.